As policymakers take another crack at housing finance reform, federal leaders and the housing lobby are once again perpetuating the notion that ending government-backed, taxpayer-financed guarantees will cause the “gold standard” 30-year, fixed-rate mortgage product to vanish. Unfortunately, the scare tactics that federal policymakers and affordable housing advocates repeatedly use to try to preserve the 30-year fixed mortgage and federal guarantees of the mortgage market rely on misleading narratives and not the experience of history. 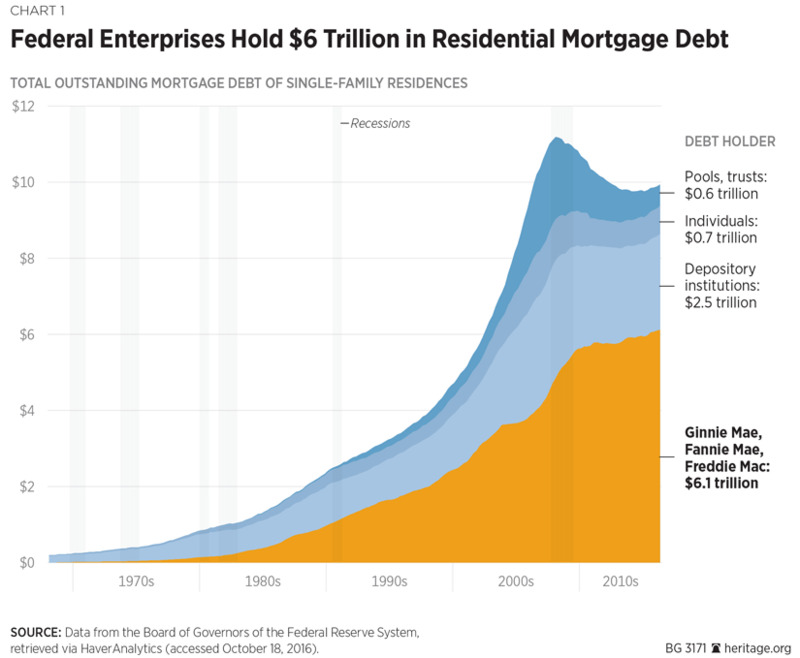 Despite the facade of a free market, the federal government has long been entrenched in the U.S. housing finance system, certainly including the persistence of taxpayer-financed government guarantees in the mortgage market. The U.S. is unique among developed international nations in the systematic involvement of the federal government in mortgage finance. Federal taxpayers cover the cost of direct government mortgage insurance agencies (the Federal Housing Administration, the Department of Veterans Affairs and the Rural Housing Service), a direct government mortgage guarantor (Ginnie Mae), and the housing finance government-sponsored enterprises (Fannie Mae, Freddie Mac, and the Federal Home Loan banks). The U.S. is also among just a handful of advanced nations with the preponderance of very long-term fixed-rate mortgages and broad federal subsidies, even though the overall homeownership rate in the U.S. remains comparable to nations that lack both. Combined with other taxpayer-financed subsidies such as the federal mortgage interest-rate tax deduction, these subsidies have had negligible impact on the actual rate of homeownership in the U.S. while encouraging American households to take on higher levels of mortgage debt in the purchase of larger and more expensive homes. The U.S. homeownership rate has in fact remained roughly the same for the last half-century after increasing from 44% to 62% between 1940 and 1960. Back when that rate was on the rise, the free market had a greater role in mortgage finance. The substantial increase in the homeownership rate until 1960 occurred in the absence of the U.S. securitization market (which developed during the 1970s) and before the systematic availability of the 30-year fixed-rate mortgage, which was not widely used by the FHA until the late 1950s and the private sector until the 1970s. In addition, for all of the taxpayer largess placed on the preservation of such a very long-term fixed-rate mortgage product such as the 30-year FRM, most homeowners only remain in their home (or initial mortgage) far less than the full maturity term. The average tenure of homeowners in the U.S. remains less than 10 years. The 30-year FRM has remained a staple product in the U.S. housing finance system for several decades and, because of the path-dependency in this market, will likely remain a viable mortgage finance instrument — even in an alternate world without government guarantees. In the U.S. jumbo mortgage market, 30-year FRMs are originated without explicit government guarantees since they are valued higher than the eligible limits to receive government backing. Their rates are competitive (even lower at times) than those backed by the federal government. In fact, about 75% of private-market mortgages are 30-year, fixed-rate, which is only marginally lower than the 85% backed by Fannie and Freddie. While homeowners can benefit from very long-term FRMs, it is erroneous for federal policy to assume that these mortgage finance instruments will work best for everyone. These products generally result in slower equity accumulation, particularly in the beginning years of the mortgages, leaving homeowners vulnerable to any sudden change in home valuation or negative economic shock. When combined with low down payments and other credit-easing efforts, they also increase the likelihood of default and drive up home prices for entry-level buyers. The ratio of median home prices to median household incomes has risen substantially since the mid-1990s. All told, despite any best intentions, government guarantees have crucially failed to result in a more stable mortgage finance system and housing markets. Indeed, over the last several decades as the 30-year fixed-rate mortgage has become the predominant financial instrument in home purchases, homes have become less affordable, residential mortgage debt has exploded, homeownership has stagnated and become less sustainable, and taxpayers have covered the cost of many hundreds of billions in bailouts of failed financial institutions and underwater homeowners. As federal reforms of the U.S. housing finance system advance, federal policymakers should avoid repeating the mistakes of the past and end any subsidies and preferences for very long-term fixed-rate mortgages. This would allow private markets to develop their own mortgage finance products free from government interference.